A few days ago, my husband and I had one of those days where absolutely NOTHING could satisfy our sweet tooths. And it didn’t help that we had nearly no sweet things in the house. As I was digging through my pantry like a crazy-lady (looking for a tin of Caramel Treat), I saw that I still had one box of “box-cake” left over from my birthday. I grabbed it, knowing that it wouldn’t completely satisfy my sweet tooth, but it had to do. I whipped up the batter, got them into the oven in their mini loaf tins and waited patiently. And then I spotted the bananas. I immediately thought of sticky, soft and sweet bananas with the moist cake and then the idea hit me. I grabbed the butter, sugar and cream and off I went making some butterscotch sauce to go with my bananas. It took some serious restraint not to dig into everything while it was still piping hot but our patience paid off. It was absolutely scrumptious! VERY sweet and VERY rich so I wouldn’t suggest eating one by yourself ( you could also bake them in a muffin tray if you want them smaller) , but this is a perfect dessert for those nights where you are snuggling on the couch with your beloved. In a large pan, melt the butter and sugar together until dark and sticky. Add the cream and allow to bubble until all the sugar is dissolved. Add the bananas and allow to cook in the butterscotch sauce for 3-4 minutes. 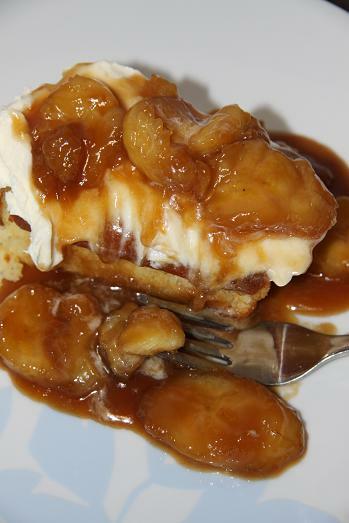 Place a vanilla cake on a plate, top with 1tbsn vanilla icing and a spoonful of the bananas and sauce.